ISLAMABAD: Another former senior officer of the Intelligence Bureau has broken his silence after the recent outbursts of Brig (retd) Imtiaz and has revealed that the former IB director-general had planned to register high treason cases against Benazir Bhutto, Chaudhry Aitzaz Ahsan, Salmaan Taseer and Masood Sharif. Following the recent disclosures of Brig Imtiaz, which have shaken both the Pakistan Muslim League (PML-N) and the Muttahida Qaumi Movement (MQM), Rana Abdul Baqi, who had served under former IB director-general Masood Sharif and retired as senior director, in an exclusive interview with The News, disclosed that Brig Imtiaz wanted to try Benazir Bhutto and three others because they leaked secret tapes to an Indian journalist and got it published in India Today. According to Baqi, the tapes which were leaked contained conversations between MNAs and Brigadier Imtiaz and Major Amir, and also included classified information about training camps of the Army and other strategic security information which may still be classified. “According to my sources, Masood Sharif and Benazir Bhutto got those tapes from you,” Brig Imtiaz blamed me, adding: “Benazir Bhutto gave those tapes to Taseer.” Imtiaz added apart from Benazir Bhutto and Salmaan Taseer, Aitzaz Ahsan was also present there and in his presence these tapes were handed over to Taseer. “I want to initiate high treason case against these four because they have handed over classified national secrets to India and you (Rana Abdul Baqi) would become approver in the case and you would admit that these secret tapes were handed over to Taseer in your presence. “I told Brig Imtiaz that three sets of these tapes were prepared each containing 12 cassettes. One was sent to the Military Intelligence director-general; one to the Prime Minister Secretariat and the third was kept in IB director-general’s office. I don’t know how Taseer got those tapes. Brig Imtiaz constituted a committee to discuss my involvement in handing those tapes to Taseer. Brig Imtiaz’s committee comprised Air Commodore Khalilullah Ghauri, Col Bashir Wali, who has remained IB director-general and Major Salim Khan. The committee inquired from me and I gave a ten-page reply on how these tapes were distributed. The Army men took the last copy of these cassettes which was at IB director-general’s office and a receipt was also given of that episode. Brigadier Imtiaz, the mastermind of the Operation Midnight Jackal, when contacted termed all the allegations levelled by Rana Abdul Baqi baseless and said he never gave worth to Rana Abdul Baqi. He said Rana Abdul Baqi was sidelined by him when he assumed the charge of Intelligence Bureau. “I never thought of giving any important task to Baqi,” said the brigadier. Brigadier Imtiaz said the Operation Midnight Jackal was kept alive against a person who has served his whole life serving the country. 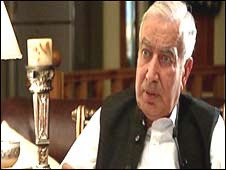 He said he, Major Amir, Malik Mumtaz (a RAW agent according to Brigadier Imtiaz) and two MNAs were discussing the political situation of Pakistan and mentioned that their views were not favourable to the incumbent regime and that the minor incident was termed the Operation Midnight Jackal. Brigadier Imtiaz said politics was, and is, discussed everywhere but that the minor incident has been kept alive till today. He said Nawaz Sharif, Gen Nasir, Masood Sharif and Rana Baqi had taken MNAs in C-130 from the Rawalpindi Cricket stadium to Swat, which was unauthorised but no one had questioned that.